Albeit the constant work-sabotage-expert, he was the best part of the week. I'll spare you the blurry-baby-wrapped-around-my-ankles photos. Very busy here, but I do want to share that sweet scarf/hood combo (scoodie?) that I made for Isabela in more detail, thanks so much for the sweet words about that! Have a great weekend and we'll try to put ourselves back together over here and be more presentable next week! Babies are the best kind of distractions! 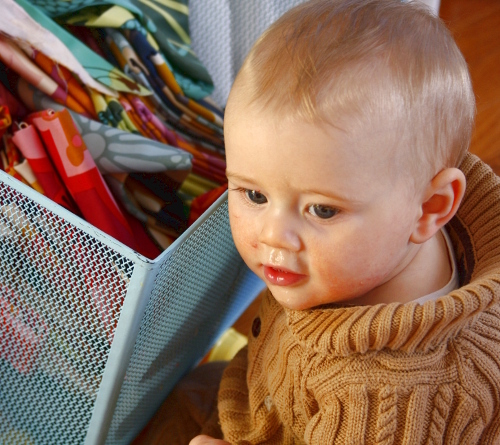 Lucky baby - look at the lovely fabric he gets to play with. No wonder he has such a big smile on his face! I'm freezing right now, I wish I was a baby so that I could wear a full body sweater too! So very cute! They sure do grow up fast don't they? Roman is so gorgeous. He reminds me of my own little man who is now 4. He used to have a special draw of scraps he would throw all around the place. Now he likes to make piles and crash his cars into them. My daughter and I agree that Roman is the cutest baby boy ever! Perhaps he's not helpful, but all that adorable-ness must make up for it! So nice to know some one else has had a week like that! With a face like that, anything could be forgiven :0. And one day (far too soon), he'll grow out of it. My cat? Not so much! It seems like every week lately is one of those! Hang in there. Aw--- snot. Gotta love it. Hope you can catch your breath. haha, I think yo're doing quite allright on presentability. Roman looks happy! Those are the best kind of distractions. Darling helper and no wonder he picked that bin it is full of beautiful fabric! I'd want to dive into that fabric basket, too! Roman is just too sweet and cute. Love that drooly little chubby face he has. OMG as they say, she is ADORABLE! Thanks for posting. Also wanted to drop you a note that I ordered several products from your website for Christmas presents. They were all so beautiful. I bought two aprons (one for my mom- she thought it was too pretty to wear but she did- and one for my mother-in-law), a set of towels I gave my 93 year-old grandmother, 2 scrap bags (one ofr me and one for my crafty 10 year old niece) and a stationary set for my good friend and avid quilter. I was so happy with each product and felt very secure in the knowledge that each one was appreciated by the recipient. Is that the next Kaffe Fassett, only better looking? Your scoodie is so adorable and your little baby boy is even adorabler;) I just want to kiss those sweet feet and sweet cheeks! So cute!!! Very nice outfit! I just saw some of your fabrics live and in person at Make & Mingle in Fairfield, CT yesterday. How lovely! Even though I live in a city and very close to another, there are very few actual fabric stores. This was a treat! Hi Anna! Where did you get that adorable knit jumpsuit Roman is wearing? Oh... if all I had to do was play in fabric scraps! Too cute! Love his body sweater! My toddler is in that same stage right now. Lot of fun and a lot of work. Oh man, he is cute. I just love the look on his face "Look what I did Mommy!" It makes it so hard to tell them no. I think that the more kids you have the more you see the cute and humor in these situations rather then the bother. My older kids always accuse me of being easier on the little ones. If I had half a chance, I'd be rummaging through your fabric boxes too. Is he sitting and crawling already. That went so fast! He is so cute! What a cute baby!! He is happy all the pretty pieces are out on the floor. ... I love baby feet with all that bubby fat piled up on top of their foot between their toes and ankles! What a cutie! I LOVE that outfit he's wearing! Could you p-l-e-a-s-e tell me where you purchased it?? Hello...How can anyone resist the happy expression of helping and a little snooping around? I sure like those sqwuishy little feet. Hummm! I think you had another baby for fun new projects. A free stunning model to boot. I would be watching him explore all the time and not get anything done. His cute factor is off the charts. Plus the family charisma. Oh, my! oh my goodness!!! so cute, I can't stand it!!! O please tell us where we can find that sweet sweater romper!!! He is adorable! I love Roman's sweater outfit. So handsome and warm! Argh! I LOVE the wooly gro! Such cute pictures! Wondering when the long dress pattern is coming out, my daughter is interested in making it for her prom! Thanks so much! Love his suit! And he is right you know! those fabrics are just the best. His outfit was on the sale rack a t baby GAP a few months ago...I had to has!!! looking way too familiar... my 10 month old can't keep her hands off my fabrics, papers, cords, etc. love it. Roman reminds me of my little man Jacob being helpful. He loves clinging to the bottom of my skirts too. Oh is he just the most beautiful little man ever!!! I so know how you feel. I have a little ones just about the same age. And he's constantly around me/on me/behind me/on top of me/before me/wherever I want to do something so it can't be done anymore/etc too :-D They are so adorable though, so you just have to forgive them, don't you? Love his outfit by the way. And I bet he loves the fact that he can play with such colourful thingies! Roman's sweater romper is yummy! Love those! Thanks to Anna Maria for telling us the store where she purchased it though! your blog is as beautiful as ever. my baby boy is a grown man now in his twenties, he was pretty like Roman and blonde and blue eyes ~ seeing your baby makes my heart feel happy and very blessed to know I got to experience the most precious thing in life and that is our children. Goodness, he reminds me of my own daughter who used to be so proud of emptying my bookshelf everyday while I showered. Drove me a little crazy but she loved it and I got a shower. She's almost 4 now and I miss the little explorer but still can't wait to see what she does next! Enjoy - what a blessing to have him there to distract you! Thanks for sharing! I found your blog just a couple of weeks ago, and I love it. The beautiful pictures, your colourful creations: lovely! Oh, and I'd really love to hear more about that beautiful scarf/hood you made for your daughter. I just started to teach myself to crochet, and making that scarf would be such a beautiful goal to achieve! OMG..i can't stand it..he's just tooooo adorable! Oh my gosh he has gotten polee megalo already!!! He is very handsome, what a cutie -- and taking after his Mama with the fabric! hehe -- way adorable. 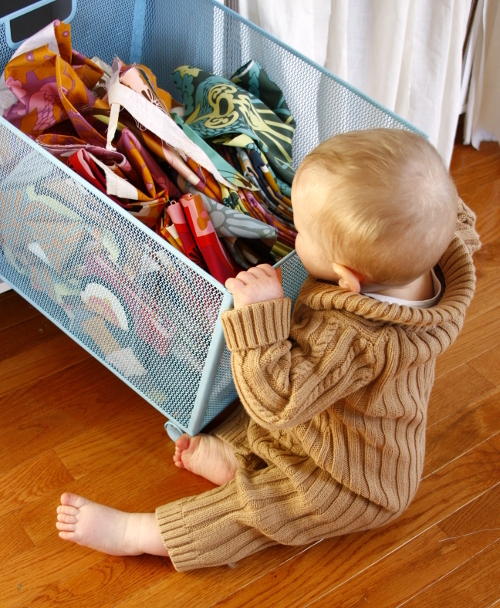 Obviously, even babies know pretty fabric when they see it. What a darling baby in that sweater/jumper! Love it! This is just too familiar! Though replace fabric with flour and bags of rice and you get the picture. Lots of mama-to-mama love and sympathy.